The problem with complexity is that everything is interconnected. While history is fundamental in shaping complex systems, explaining the unfolding evolution and future of a system is not like explaining the past behavior of a system. As they say, 20/20 hindsight doesn’t translate into accurate foresight. But hindsight can so easily seduce us to thinking we can create maps of changing conditions. Compounding an understanding of complex situations (as a precursor to trying to explain them) is knowing where to begin. It’s like trying to decide what came first – the egg or the chicken; or the one or the many. Still, any explanation or journey has to begin somewhere. Yet, often the beginning seems like an arbitrary choice. Even when we do choose a place to begin, the next steps are just as difficult – which of the interconnected aspects of the situation, will we decide to follow next? It’s not just a problem of connecting the dots – it’s a problem explaining how they all work together to create the whole, that in turn, makes them more than a sum of parts. Explaining reality and change can seem like simply exercising common sense because we are imbued with a narrative sensibility. We assemble fact, events, dots, into a picture, pattern, story or narrative. We have learned to reason by developing an argument as a linear set of propositions, that aim at an ‘inevitable’ conclusion – much like a story leads us to its climax. As humans we seek to find a pattern that makes situations intelligible. Another way that helps us to create an intelligible world is, as Marshall McLuhan has noted, because we tend to move into the future looking into the rear view mirror. This is deeply entrenched in our management metrics which involves, creating as rich a picture of past performance as possible, and extrapolating this performance forward. These issues combine to make the challenge of talking about the future, very difficult. For example, a typical environmental scan discusses key trends and drivers of change within distinct categories, such economic, technological, demographic, social values, environmental, political and governance. It’s not as if a deep analysis of the each trend is not useful – trend analysis is essential and does help to deepen understanding. n the very environment in which we are exploring – like observing changes what is being observed. It is for this reason that foresight continues to develop methodologies to imagine the future – such as the development of scenarios as a means of integrating all of the trends and drivers within narratives of a range of plausible futures. Scenarios help participants to formulate plausible maps of plausible futures. But that too can hide a profound difficulty. Maps as we all know are not the territory – just as menu are not the meal. But maps can give us the illusion that we can navigate the terrain. And that’s the problem. Navigation is only possible when we have a framework of trusted coordinates. Navigation is about getting from point A to point B, or travelling through a series of landmarks. This is fine when the landmarks are stable/trusted – when they reflect past experiences. But when maps are not possible because the very landscape is changing, then we are forced to ‘wayfind’ – figuring out the territory as we explore it. What makes wayfinding even more difficult, is if the territory is itself changing as we are exploring, and/or because of our explorations. In this blog I will put forward a series of efforts, to wayfind the future of the digital environment – how we will work, how we will create value, how we will develop new institutions, and more. Eventually, I hope to assemble these wayfinding efforts into some form of integrated knowledge product. Since this is inevitably an unfolding journey, without any form of definitive end, a traditional table of contents outlining the landmarks of this journey is impossible. Worse yet, even when an integrated knowledge product can emerge, it will not be able to provide a linear narrative. What I think can be most useful is an ongoing map of contents that can help to visualize where we've been and where the possible next landmarks on the horizon are – a history of the map of the changing map. 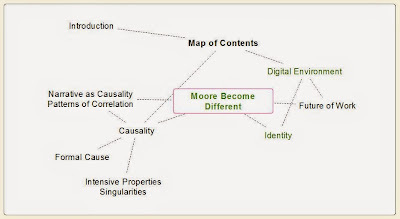 The concept map below represents a current moment of my blog posting here and elsewhere. I will be re-posting reformulated thoughts I've presented in other blogs, and developing the concepts further. 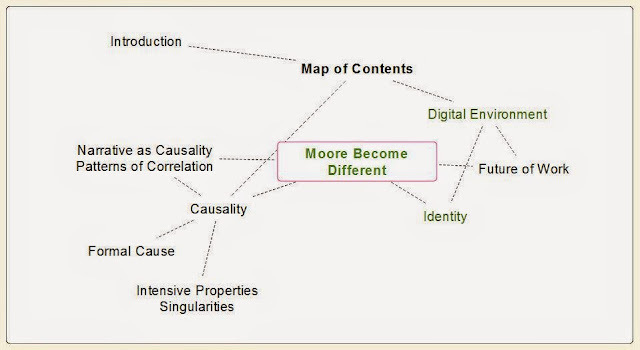 What I hope the concept map can do – is enable a non-linear, more complex form of narrative exploration. 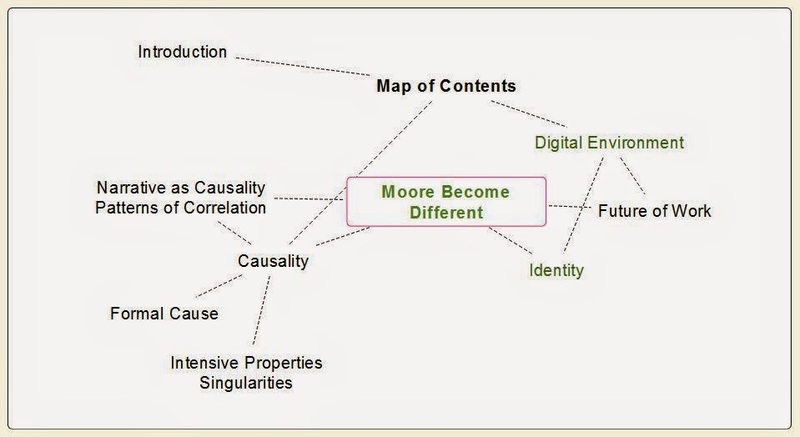 With each blog post, the concept map included, can present dynamic interconnected mapping of wayfinding.